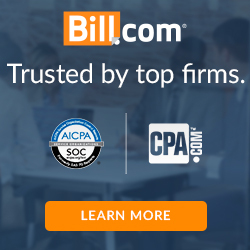 If all your clients have all their vendors’ tax information, 1099s are a breeze. But, let’s be honest, how often is that the case? You’re more likely to get roped in by your clients to track down missing info like some sort of TIN bounty hunter. And getting that info is a no small feat. “Excuse me, sir. Can you please provide your sensitive tax information to me so that I can send you a tax form that increases your taxable income? Thanks!” C’mon now! It’s a non-starter. But, there’s a better way — get the W-9 upfront. Ideally, before the first payment is made. And, if your clients are the ones responsible for this workflow, then add another set of bullets for forgetting, losing, and not completing the form. The key is to create a process that is easy on you (or your client) and simple for your vendors to understand. You can email a W-9 to all new vendors and ask them to print, fill out, scan, and return. Emailing a W-9 is pretty easy on you. But, the steps for the vendor to return are tedious. And, the W-9 form can be a bit intimidating (e.g. “What’s FATCA?”). You can print the W-9 yourself and collect the form as part of a vendor onboarding process. That’s easier on the vendor, but a bit harder on you. You’re now shuttling pieces of paper around with sensitive tax info on them (not the most secure process in the world). Plus, there’s still that data entry piece. 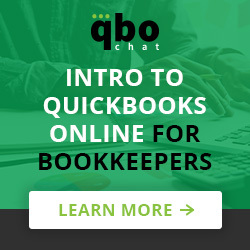 Or, you can use an automated solution like Payable. With Payable, all you need is the vendor’s name and email address. The software handles the rest. The info that’s collected on the W-9 is broken into easily understood steps for the vendor. Once, the info is collected, it’s then automatically loaded onto an official W-9 that the vendor can sign directly in the Payable application. All of this can be done securely from the vendor’s mobile device. It’s easy for you. It’s easy for your vendor. It’s secure. And, the information automatically feeds onto the 1099 form you need to generate at the end of the year. 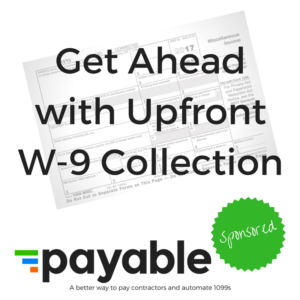 Regardless of which method you choose, if you’re not collecting W-9s from your vendors, start doing so! It’ll save you a mountain of headache when January rolls around. Tad is the Co-Founder and CEO of Payable -- a platform for W-9s, 1099s, and Contractor Payments.